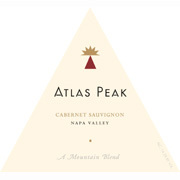 Big, and bold, this fantastic Cabernet Sauvignon from the good people at Atlas Peak Vineyards. Napa Valley is home to so many of my favorites, and this one quickly joined the list. It is a mighty cab that grabs right hold of you and doesn’t let go until you’ve finished the last drop. On a Friday night after a tough work week, the Atlas 2005 goes just perfectly with a grilled steak and a few scattered veggies that you pull off just to keep from feeling like a complete Viking. 2005 Cabernet Sauvignon “Mountain Blend”, Atlas Peak Vineyards, Napa Valley, California, CA. Pretty big talk, right? This bottle was part of a Buena Vista wine club membership, so finding it again will not be easy–the 2008 seems to dominate in online search–but the quest will be rewarding. This entry was posted in Cabernet Sauvignon and tagged napa valley cabernet sauvignon, USA.